Head to Fremantle Markets and Glen Cowans' Studio at the Roundhousefor some retail therapy. 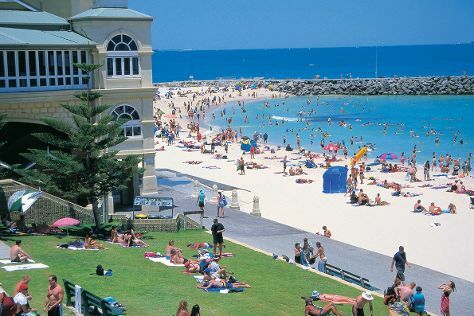 Escape the urban bustle at Cottesloe Beach and Swan River. Change things up with these side-trips from Perth: Rockingham (Penguin Island & Point Peron), Fremantle Prison (in Fremantle) and Dolphin & Whale Watching (in Mandurah). Dedicate the 15th (Wed) to wine at some of the top wineries in the area. On the 17th (Fri), give your taste buds a day to remember with a local gastronomic tour. There's lots more to do: identify plant and animal life at Caversham Wildlife Park, stroll around Kings Park & Botanic Garden, snap pictures at Elizabeth Quay, and take in the exciting artwork at Red Dirt Photographic. For more things to do, photos, reviews, and tourist information, go to the Perth planner . If you are flying in from Singapore, the closest major airport is Perth International Airport. In May, plan for daily highs up to 25°C, and evening lows to 11°C. Finish up your sightseeing early on the 17th (Fri) so you can travel back home.